I love living in the northeast. 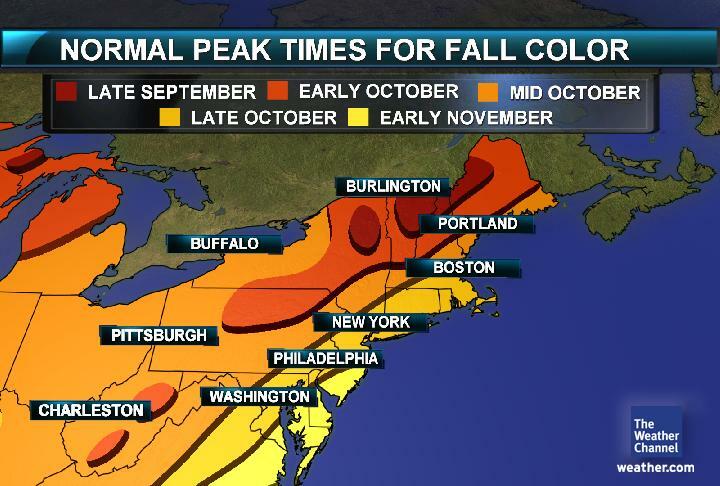 The northeast enjoys four distinct seasons. Even though lately one season seems to leap-frog over another and then we go back to the “correct” season. Warm weather in April then back to rain in May and then back to whatever in June. The last few days I have been noticing that the leaves are starting to change color. When my daughters were growing up, they commuted with me to my work, their childcare then their elementary school and eventually high school. This time of year I would ask “which coloring is winning?”. Basically to keep them entertained and on occasion as a teachable moment about seasons or colors or creation. As the year’s past and my daughter’s grew too old for the color game, but every now and then one of them would randomly say “I think orange is winning”. 🙂 Today as I drove that same route I smiled and thought I think green is still winning but soon it will orange or yellow or red. From the looks of the fall foliage map, you have time to plan a drive to check out “what color is winning?” Don’t forget your camera. And why not stop for some cider and donuts. The autumn leaves swirl to the ground in their millions. Gold, russet, ochre, burnt umber, and deep vermillion. On to the grassy bank, the pathway, and into the gutter. Some of the colours of the leaves are deep and so very rich. Whirling along the ground, some leaves tumble into the ditch. Leaving the trees bare, in readiness, for next spring’s rebirth. But, that summer is well and truly over, it is now perfectly clear. I love the shades of yellow, crimson, sienna, and ruby red, so bold. Adding to the fabulous display, which now lies upon the floor. When workmen collect them up, they’re left feeling very aggrieved. Even though the weather is getting cold, the colours look so warm. Fiery reds and oranges, and golden hues, like those of ripened corn. The spectacular displays before them, they spend much time admiring. As the season draws on, the once vibrant colours begin to dull and fade. Soon, all that is left are brown leaves, which once boasted brilliant shades. But with age and weather, over the coming weeks, there is much spoilage. I love the dark green leaves, with their edges tinged with a brilliant red. But, alas, those colours will fade, now that the leaf is no longer being fed. But in our minds, we know it won’t be long before winter comes our way. September is National Preparedness Month. Both the Red Cross and FEMA have some great information on their websites. I thought I would share a few thoughts for emergency preparedness when traveling. 1. Add a I.C.E. ( in case of emergency ) contact to your phone. 2. If traveling oversees, add the American Embassy’s phone number to your phone. 3. Pack a flashlight and extra batteries. 4. Carry your prescriptions in your carry on. Put an extra glasses in your carry on. Hearing aid batteries in your carry on as well. 6. If you are told to evacuate, evacuate!!! 7. Let someone know your travel plans. Even if you are “running away”, let someone who will not bug you know where you are. 8. As I say to the school groups at the Tribute Center, we don’t live “afraid”, we live “aware”. Pay attention to what is happening around you. 9. Have a photocopy of your passport. 10. Write the toll free number for your credit card on a piece of paper, in case your card is lost or stolen. This morning as I was standing outside of the Tribute Center waiting for the 11:00 am walking tour to begin there were many people walking down the street. Which that in itself isn’t unusually. Walking by were your basic slightly confused visitors who aren’t sure where the entrance to the National September 11 Memorial is. There were your average New Yorkers weaving in and out of the slower walking visitors and then there was a group of Naval officers in their dress whites. And mixed in with the officers were a group of kids and adults in bright blue t-shirts. At first glance we thought they were together which made no sense but who knows. This is New York. As more and more Naval Officers kept coming down the street, we realized they were from all different countries. But every now and then there was a kid, two or three in a bright blue t-shirt. Finally one of the Tribute staff asked one of the passing Naval Officers who they were? Obviously we knew where they were going but who were they? The gentleman stated “they were Naval Officers from the War College in Norfolk, VA.” My curiosity was getting the better of me so I asked one of the passing children who they were? A delightful ten-year old said “Kids for Peace” and handed me a construction paper heart with a lovely message on it about hope, love and peace being in your soul and bubbling out into the world. Then I asked one of the blue t-shirted adults “are you with the Naval officers?” She gave me a strange look. “No!” They were just walking down the street at the same time, heading to the same Memorial. And there was just something amazing about that. As we started our tour and came around the corner, the “Kids for Peace” were standing in front of FDNY 9/11 Memorial singing to the “War College” Naval Officers. And I thought wow!!! The word juxtaposition came to mind not sure if it is actually the right use of the word but wow!! I pledge to use my words to speak in a kind way. I pledge to help others as I go throughout my day. I pledge to care for our earth with my healing heart and hands. I pledge to respect people in each and every land. I pledge to join together as we unite the big and small. I pledge to do my part to create PEACE for one and all. I have to share this story. I know some people wouldn’t agree with me and that is fine. Some people may not even get it and that is fine, too. But this morning I just witnessed the most amazing example of God’s love for me. An example of his fingerprints all over everything. As I checked my email, I had my daily 9/11 list server email. I subscribe to this post and most days I glance down the list is see if there is anything I should know. I may or may not click on an article or YouTube video. Some days I delete it without reading anything. It helps to keep me informed about all things September 11 including books, the National Museum, etc.. Today a YouTube video by New York City Ballet was included. I clicked on it, watched a beautiful piece that was performed on the roof of 4WTC at dawn. 1WTC is visible in the background. The music, the choreography, the dancers everything about it is fitting and appropriate as a September 11 tribute which it is. New York City Ballet presented this as a “gift of remembrance”. It is stunning. Social media connects us is marvelous ways. I believe God is constantly connecting us to each other and to Him. I am grateful and awed. *I don’t have the photo yet but when I do I will post it. 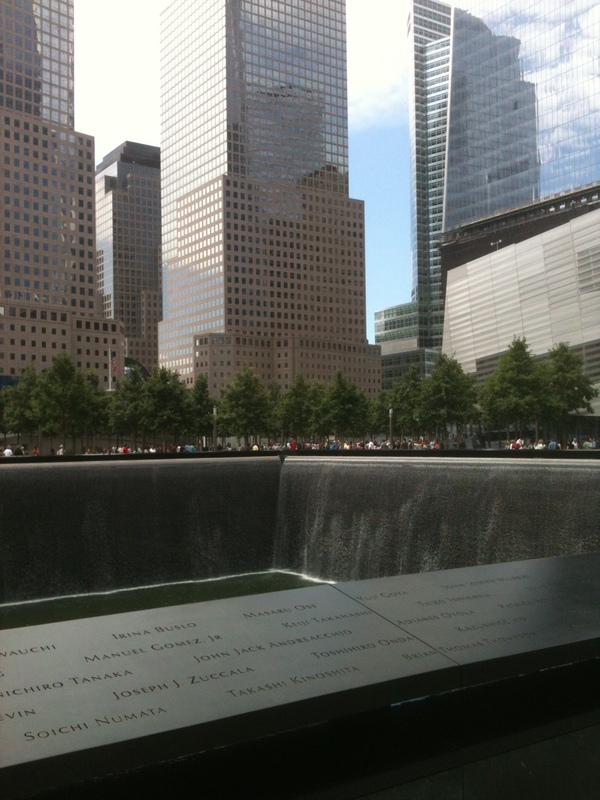 It seemed appropriate to write about the National September 11 Memorial and Museum today. I do want to clarify a couple of things. First the National September 11 Memorial and Museum is currently just a Memorial. The projected date for the Museum to open is Spring 2014. Secondly even though it is called the National September 11 Memorial and Museum it is not funded by or overseen by the government. It is a private entity and funded by donations. The Memorial recognizes all who were killed at the three attack locations on September 11, 2001 – World Trade Center, Shanksville, PA and the Pentagon. It also recognizes the 6 people including the pregnant woman and her unborn child who were killed in the Feb 26, 1993 terrorist bombing at the World Trade Center. I would suggest you start your visit to the Memorial and the Tribute Center, 120 Liberty St where you can view 5 small galleries that tell the timeline of September 11 from the attacks to the rebuilding and sign up for a walking tour. http://www.tributewtc.org/walktours. The Tribute Center is a project of the September 11 Families Association and opened in September of 2006. Walking tours led by volunteers who have a personal connection to September 11 started in the fall of 2005. Each walking tour is led by either a family member, first responder, downtown resident, survivor or someone who volunteered at the site. The basic concept behind Tribute is person to person history. You will hear the facts of September 11, the development of the original WTC will be discussed, the rescue, the recovery and the rebuilding will be explained. But by far the most amazing part will be hearing the stories of the two docents leading your tour. I have personally been volunteering since February 2006. The tour starts at the Tribute Center, proceeds to Greenwich Street where you see and learn about the FDNY Memorial. This is also the “Photo Op Spot” to get the great photo of 1 WTC and 7 WTC. Once you are on the Memorial you are too close to 1 WTC to get a photo of the whole building. The tour then continues through security, under the south bridge which is the last remaining above ground piece of the original WTC. One more security checkpoint and you are standing on the Memorial Plaza. If the buildings were still standing, you would be in the lobby of the Marriott (formerly the Vista) Hotel. The Memorial Plaza is and should be considered hallowed ground. Of the 2,749 people who were killed here on September 11, 2001, 40% of their families have never had any human remains. One of the first things you will notice is the trees. When the Memorial Plaza is completed there will be 400 trees. If you look north to south, the trees appear to be random. In a few years the trees will have grown to their full height, as you look east to west the tress will be arched to form the look of an arbor or the entrance to a cathedral. As you approach the South Memorial pool, you will hear the sounds of the waterfall and the sounds of the city will drift away. 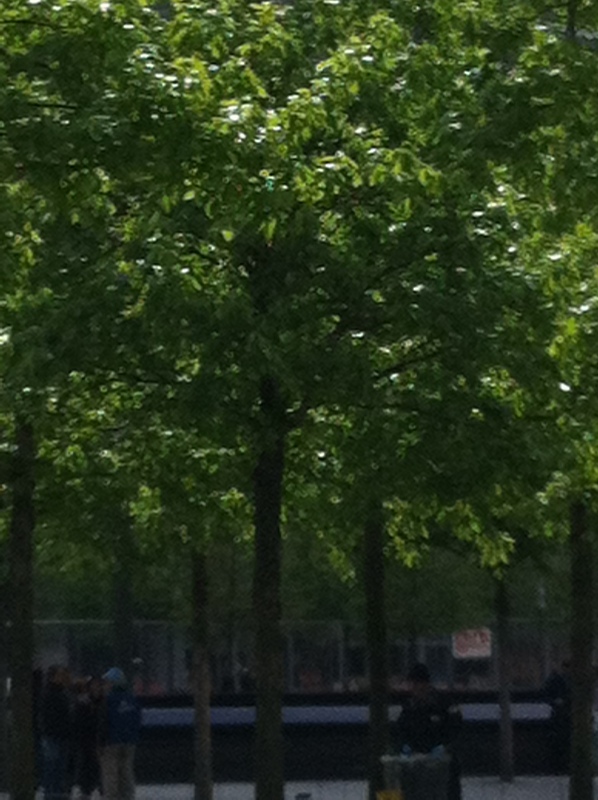 Once you walk past the last row of trees, you are standing in what would have been 2 WTC or the South Tower. The last row of trees before the pool is where the outside walls of the South Tower used to stand. The trees mark the acre in size. 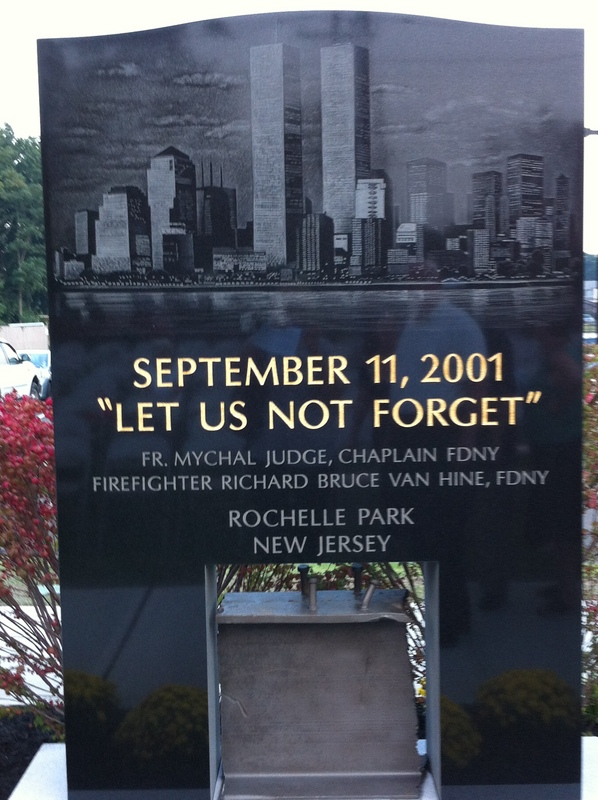 The black granite in front of you contains the names of the 595 people killed in the South Tower, the passengers and crew of the flight that crashed into the south tower, the passengers and crew killed on the plane and in the Pentagon, the passengers and crew of United 93 and all first responders – 343 FDNY, 23 NYPD, 37 PAPD as well as a court officer, FBI agent and WTC security people. There names are etched out because they are gone. Below the granite panel there is a shelf of water that will become the waterfall then pond and then become a waterfall again disappearing into a void that you taken see the bottom of. You can touch the water. You can rub water over a name. And whether it is very hot out or very cold out you can always touch the names because the panel is cooled in the summer and heated in the winter. The north pool is similar in design but has different names etched into it. The names of 1360 people who were killed in the 1 WTC or the North Tower, the passengers and crew of the plane that crashed into the North Tower and the people who were killed in the Feb 1993 bombing. There is all kinds of interesting facts and stories I could tell you about “meaningful adjacencies”, the rebuilding, the survivor tree, the surrounding neighborhood, the new Museum and St Paul’s Chapel and an urban legion but then you won’t need to take a tour. 🙂 You can go to the Memorial by yourself but trust me you will get so much more out of the experience if you do a Tribute Center walking tour. As my dentist walked into the examining room last Friday, he commented “I was just talking about you the other day.” Of course, I commented “why”. He told me that he has a foreign exchange student living with him and the student’s assignment was to write about what he remembers about September 11, 2001. There were two problems with that assignment this particular student is from China and this is a class of high school sophomores. This young man is a little older than his classmates but he is still only 17 so he was 5 in 2001. We chatted back and forth about how young these students were when September 11, 2001 happened and that they shouldn’t really have memories of that day. I asked “what did the young man write about.” My dentist asked the student what he knew and he remembered learning that something had happened in America but no real details. My dentist told the student that he had patients who were directly affected, shared my story and also told his personal memories of that day. And so 12 years from September 11, 2001 you have people who have real personal “I remember…” memories but you also have a generation who wasn’t old enough to have memories or weren’t even born. And very soon “I remember on September 11…” will sound to kids/teens the same way “I remember on December 7…” sounded to me. Even though it seems like ancient history to young people, we have to share those stories so those stories can be retold to future generations. 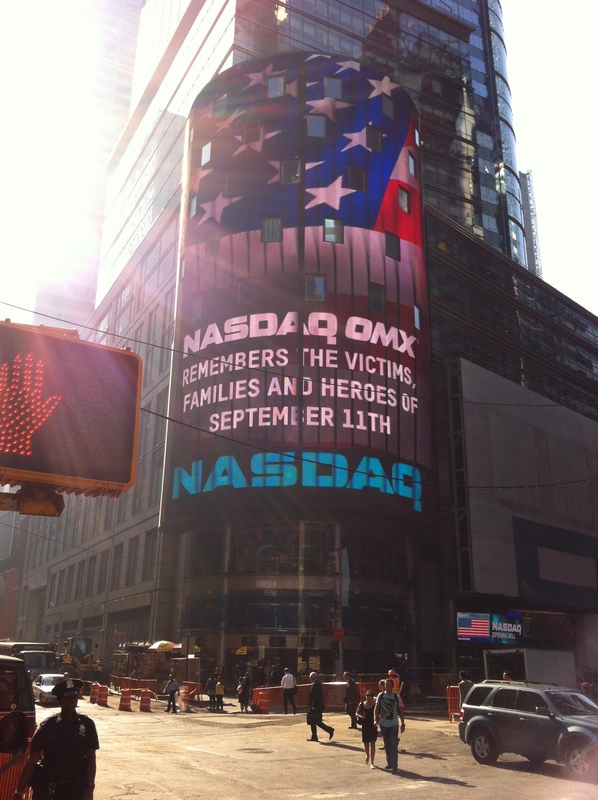 As September 11, 2013 approaches, my hope is you will tell the next generation your September 11 story. My prayer is that the next generation will not have their own December 7 or September 11. I heard on the radio that today is the day in 1972 when eleven members of the Israeli Olympic delegation and 1 police officer were killed in Munich due to a terrorist attack. I remember that event. I can still see the images of the bus being blown up on the runway. I was horrified that such a thing could happen at the Olympics. I wrote a poem about it and I actually still have that poem. What I understand now, that I never could have dreamt then would be a possibility is that I can appreciate it what it feels like to have a “personal loss in the midst of an international tragedy”. I almost called this post “scholars and Shakespeare”. I love Oxford – the colleges, the gardens, the bicycles, thoughts of who walked the cobbled stones streets before you, who sat in the church you are seating in, who hung out in the same pub or cafe. Oxford is so rich in history, architecture, stories. Oxford is the place of my birth many years ago. My mum always says “she gave me a good start and after that I was on my own.” 🙂 I left England when I was under two years of age. Not sure I could glean much from Oxford at age 1. I will admit that when people hear where I was born, many times they say “really?!?”. I control myself and don’t respond “no, I was lying.” Anyway. Radcliffe Infirmary where I born no longer exists. My mother’s cousin and I joked that after I was born there and then years later her son, there was no need to keep it open – the best had been delivered. lol. I hadn’t realized it was only a block away from where I had booked a dorm room during my visit this summer. University rooms is a good website for finding dorm rooms to rent. http://www.oxfordrooms.co.uk. Bed and breakfasts and hotels in Oxford are pricey. My daughter, her hubby and I stayed one night at Keble College. Keble College is one of the 39 colleges that are part of Oxford University. It has the longest dining hall in Oxford. Think Harry Potter. Wow!! Full English breakfast is included with your nights stay and the atmosphere of the dining hall is worth every penny. Added bonus, the food was delicious and plentiful and the staff was delightful. 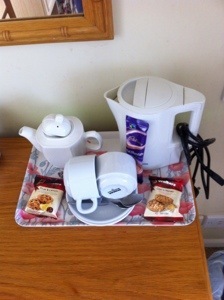 One thing I noticed in each place I stayed in Britain was the rooms have a hot water pot, china cup and saucer, tea bags, biscuits aka cookies, milk and sugar all beautifully placed on a tray. It seems so much more civilized than the coffee pot and styrofoam cups in American hotel rooms. I also spent two nights at the Merifield Annex of Wadham College in an area of Oxford called Summertown. A 10 minute bus ride and I was in the city center. In England you don’t say “round trip” the term is “return.” Another lesson learned. Merifield Annex was very convenient to city center and the neighborhood included grocery stores, cafes, and even the community center with pool. After Oxford, I headed to Stratford-upon-Avon, the home of Shakespeare. Great black and white buildings, some with thatched roofs, swans on the river Avon, and boat tours all make Stratford a lovely place to visit. 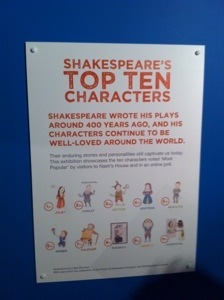 Shakespeare’s birthplace and visitor center is informative without being “stuffy”. http://www.shakespeare.org.uk You do have to watch a short video before you can proceed to the next room in the visitor center but the video is short and sweet. They actually do that with each room. There is information that is presented and the door to the next room doesn’t open until it is done. Not sure how everyone feels about this technique but I found it worthwhile and not overly long or boring. Most of the sights connected to Shakespeare are within easy walking distance. (Anne Hathway’s Cottage is not as centrally located as other sights. Learned that many years ago when a friend and I walked there. it was further than we thought it would be).You pay one admission for a couple of different sites and your admission price allows you to return within the year. Good deal.